Beach-based chess master Robert Morrison says he’s done something no other Canadian player of the game has. “I do have one particular distinction—it’s not a great distinction—but I am the only Canadian ever to play Kasparov in a one-on-one tournament,” he said. The game between Morrison and Garry Kasparov, the former world chess champion many believe to be the best to ever sit at the board, took place in 1981 in Austria at a world youth championship. 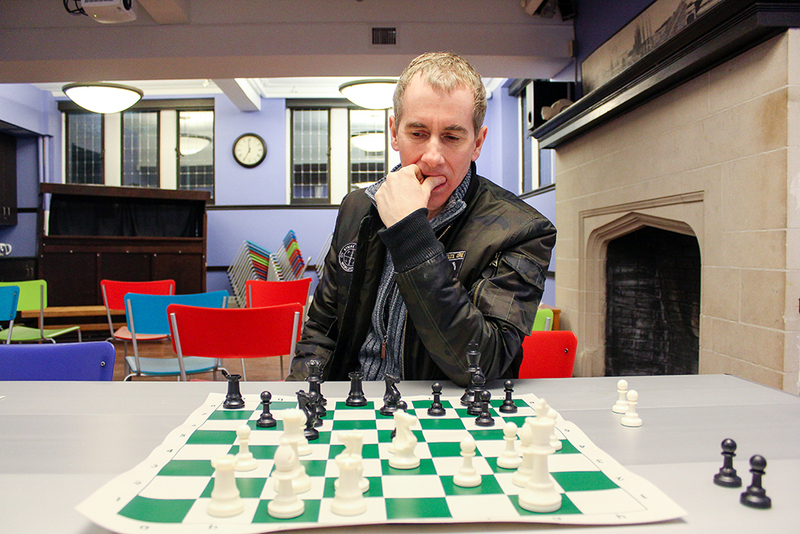 These days, Morrison can be found in a more casual setting: at the Beaches Library, where he is taking on challengers and providing some free chess instruction as part of the Queen Street branch’s programming this winter. “Chess is a passion. It’s a hobby,” he said, plunking a knight down on a board set out before him at the library on a frigid January evening. Chess has captured Morrison’s imagination for decades. When Morrison was five years old, his dad taught him the game, but he wasn’t a natural. “I certainly wasn’t a prodigy,” he said. He didn’t even make the high school chess team for the first few years, a slow start he chalks up to sloppy play. He resolved to focus more on the game, limiting himself to playing only one match per day at the afternoon chess club. “After that, win, lose or draw, I would leave,” he said. “As soon as I did that I started winning game after game after game,” he explained. Around that time, he took second place in an Ontario junior championship. In 1981, he earned his crowning achievement. He placed first overall in the invitational Toronto Closed Chess Championship. “That was my biggest thrill, I suppose,” said Morrison, who also tied for first in the closed tournament in ‘82 and again in ‘84. An investor who turned $300,000 into more than $10 million, Morrison now wants to share his passion and hobby with others as a way of promoting the royal game and giving back to the community. At his next free event, scheduled for 7 p.m. on Feb. 6 at 2161 Queen E, Morrison will take part in a simultaneous exhibition which will see the master play multiple opponents at once. Follow-up events at the library are scheduled for 7 p.m. on Feb. 20 and 27. Morrison said that through years of competition chess players develop “a kind of fluency” in the game that makes facing off against multiple opponents simultaneously easier. Tuesday’s simul won’t be Morrison’s first, and he has played as many as 40 people at once. “It wasn’t that hard because they were primary-school students,” the chess master recalled.